Sue Liberman, president of the Senior Statesmen of Virginia, will be the forum moderator. 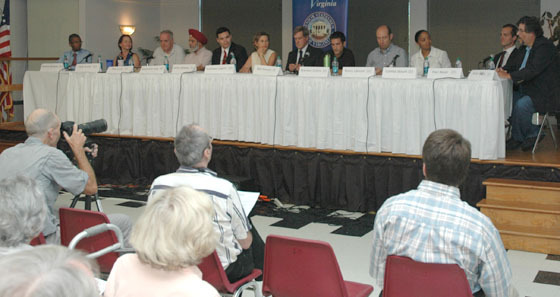 Each candidate gave a three minute opening statement before questions were taken from the audience. The candidates bios are given in the August Newsletter at the link above. The seven candidates vying for the Democratic nominations to City Council and the five independents shared their experience and positions at the SSV Candidates Forum. Scott Bandy (I) is running to bring a different perspective to the race. Paul Beyer (D) is running because he is a hometown guy and a businessman with an arts background. He wants to look at the arts as a driver of our local economy and a middle class jobs source and the cultural life of the city. Colette Blount (D) brings her experience as a teacher, school board member and her ability to connect to the community and her dedication. Her three key concerns are the jobs market, affordable housing and schools. Brevy Cannon (D) is running because he believes middle class jobs are the city’s biggest challenge. Job training and mentoring is needed along with tax breaks to encourage job creation. Brandon Collins (I) says that as bad as the current economic crisis is, there are many families who have spent their entire lives in economic crisis, and he does not want to see continued great suffering to be the legacy we leave for the future. Bob Fenwick (I) spent seven years in the Corps of Engineers building bridges, and was a combat engineer in Viet Nam. With regard to the water controversy, he comes from the perspective of “dredging-first-option,” but he can converse civilly with those who are “dam -first-option.” Kathy Galvin (D) comes from a blue-collar city where she witnessed the closing of factories and the withering of neighborhoods. She is an architect with a vision for a greener, smarter Charlottesville by design, a city that expands economic opportunities especially for the most vulnerable while minimizing the regional footprint. James Halfaday (D) was elected to his hometown council at age 18, the youngest official in Illinois history. He doesn’t run from a script, but rather from his heart and mind. His focus is on education to close the education gap and accountability so that city council will be responsive. Satyendra Singh Huja (D) is the only incumbent running. He points to his achievements including the downtown mall, but looks to creative solutions for future needs. The city has a bright future, but there is a need to improve the environment, safely walk and ride a bike, improve transportation system, infrastructure, water and sewer lines, and housing. Paul Long (I) has been in Charlottesville since 1998 and is running because he is disgraced by the way we’re treating our homeless people. Dede Smith (D) is running because she loves Charlottesville and wants to see the city maintain a high quality of life for generations to come. She has a long history of community service and cofounded citizens for a sustainable water plan. Andrew Williams (I) is a full-time student and claims adjuster for State Farm. The purest form of representation at local level is independent. His core principles are sustainability, honesty, moving forward, and helping the major populace without ignoring the concerns of the few.